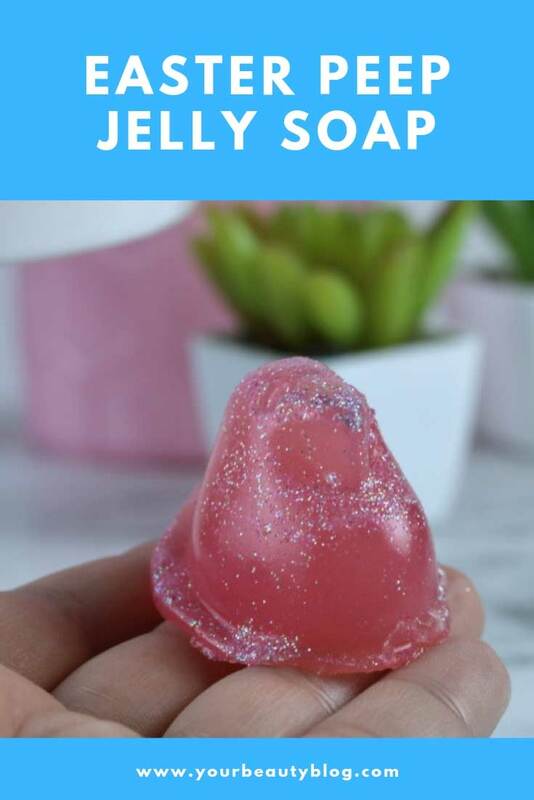 I make my jelly soap from scratch, but you can also buy a base. The base works like melt and pour soap, so it's pretty easy to use. Just melt it, add your color and scent, and pour it into molds. If I were making this as a gift, I would use it because it's easier. However, it is expensive. 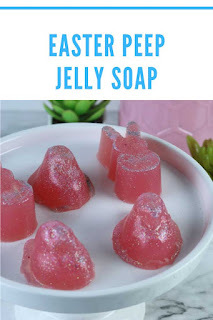 The recipe that I used for homemade jelly soap is less expensive, but it does take longer to make. You can decide which was is best for you and your needs. I was buying Knox unflavored gelatin at the store, but it was expensive. It was around $1 for each packet when I bought a 4 pack. They have a 32 pack available on Amazon. I bought a small container of bulk gelatin at a bulk store, and it was a lot cheaper. You can also find bulk unflavored gelatin on Amazon. This is what gives this homemade jelly soap recipe it's suds and what makes it a soap. I used Crafty Bubbles liquid castile soap. You can use Dr. Bronner's liquid castile soap . Just make sure you get unscented or if you do use a scented one, don't add more scent. I used Intense Berry from Crafty Bubbles. It's from their new line of natural fragrance oils. I used a little less than what the recipe calls for because it's, well, intense! You can also use any soap safe fragrance oil or essential oil. I've made homemade jelly soap with both mica and soap colorant. Both are pretty, but the mica seems to give it more depth and a prettier color. It's personal preference. This is the set of mica that I use. There's a small baggie of each color. I'm sure this set will last me until I die, then my daughter will use it and still have some left over. However, there is a biodegradable glitter available. When I run out of glitter, I'll most likely get that glitter because I like the idea that is biodegradable. I used an adorable Easter Peep mold, and I love it! I'll definitely be using it next year for something different. I don't see the mold available on Amazon or anywhere else except eBay for an insanely high amount. This Easter bunny mold from Wilton would also be cute for these homemade jelly soaps. This recipe would work in another mold. I do recommend using a silicone mold because I think they are easier to unmold than a plastic mold. Stir well. I use my Pampered Chef whisk for things like this because it really helps get out the clumps. It's the flat one like this metal one . Add the liquid castile soap. Stir well. Add the mica or soap colorant. I used mica because I think it looks better in homemade jelly soap. Dust the mold with glitter. 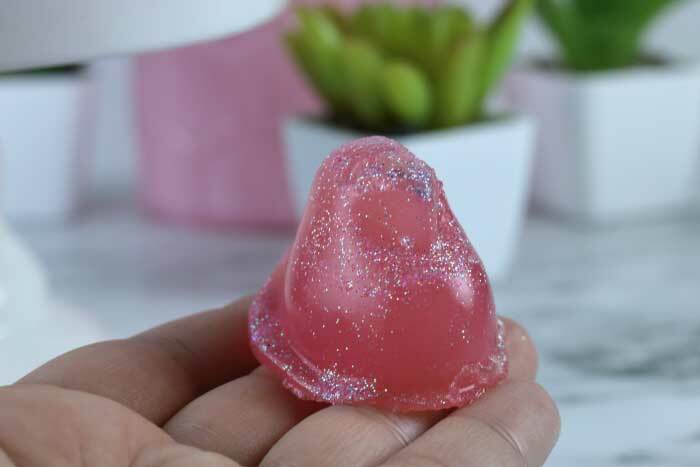 It doesn't want to stick on the sides of the mold, but just spray some water on the sides and then dust with glitter. If you are using a flatter mold, it should dust just fine. Slowly pour the melted jelly soap into the molds. If there are air bubbles, spray with rubbing alcohol and watch them disappear. Place in the fridge and allow to harden for a few hours. How long it takes depends on how deep your mold is. These Peeps are deep, so I just let them sit overnight. The easiest way that I've found to unmold these is to gently peel the soap away from one edge of the mold and work your way around the mold. They should pop out. 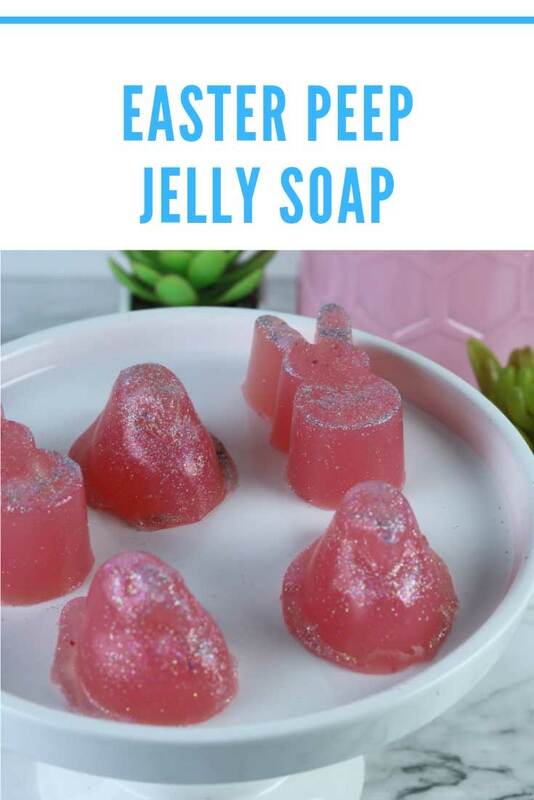 How cute are these Easter Peep jelly soaps? I did have a lot of glitter on the head, but I just wet my finger and washed away the top layer of soap and glitter. Heat the water to boiling. Remove from heat and slowly add the gelatin. It's best to sprinkle the gelatin into the water or it will clump. The easiest way that I've found to unmold these is to gently peel the soap away from one edge of the mold and work your way around the mold. They should pop out.